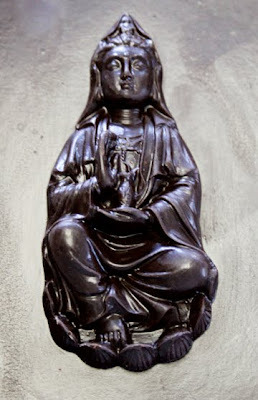 ... there was a dark chocolate Kuan Yin. Well, there is. And other chocolate things like Buddha, Krishna, Oms, etc... It was an anniversary present for me. The traditional gift for the 6 year anniversary is candy. That husband of mine is clever:) Check out www.chocolatedieties.com.